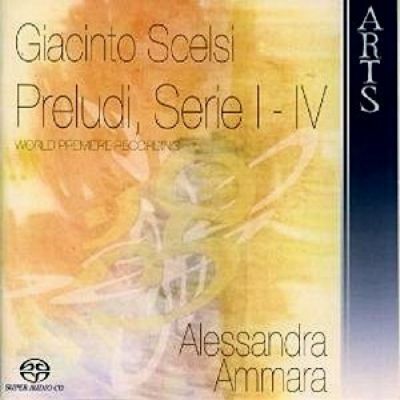 Preludes for piano, Series I, II, III, IV. Pianist Alessandra Ammara came to attention with brilliant performances at important international piano competitions. Her fine playing of these amazing works is vital to their appreciation, and she wrote the short but useful descriptions in the notes on each of the 50 pieces. Also vital to appreciating the subtleties and wide dynamic range of these Preludes is the hi-res surround sound provided by Arts on this SACD. The concert grand used is a Borgato, which I hadn’t heard of before but it sounds fabulous. Giacinto Scelsi was born into a titled family, studied music in Rome with Giacinto Sallustio, and later studied composition with a pupil of Arnold Schönberg’s, Walther Klein. He also received tuition from Egon Köhler in Genève. Throw into this melting pot the influences of Ottorino Respighi, Alfredo Casella, the surrealists, fauvists and futurists of Paris and elsewhere, and link the Preludi to Scriabin, Debussy, and even Chopin, Liszt and Messiaen, and the potential for a rich mixture of styles was always ever present.The younger Scelsi was a faithful follower of Schönberg’s serialism, but after a personal crisis at the end of the 1940s all rules were left up for grabs. He subsequently saw music as something of three dimensions: Pitch, duration, and depth of tones. This latter is hard to define, but it would appear that this had much to do with both the resonances above and below the note, and the perception of music: each listener at one point in space always hearing a different music to someone in another point. The logical conclusion was that Scelsi’s emphasis was on the creation of the composition rather than its performance. Scelsi also changed faith from Catholic to Eastern philosophies, another aspect of his life which would deeply affect his works and lifestyle. If little is known of Scelsi, then he succeeded in not wishing to become well known. He allowed no photos of himself to appear along with his work, and only after his death were a few pictures of the man brought to light.The Preludi are in some ways as enigmatic as the composer himself. They form a kind of musical diary which covers 20 years of Scelsi’s life, and, mostly unpublished, reveal a depth of exploration and expressive experiment which is quite an eye and ear-opener. Even after a good deal of research and reconstruction we can’t be sure that this recording presents the entirety of these works, but as it stands this is a remarkable document in sound. Alessandra Ammara is best known for her recordings of Chopin and other romantic repertoire, and I find her style of playing the perfect vehicle for these pieces. Her phrasing and sense of rubato – always restrained and understated, nonetheless provides this music with the expression it deserves. It would be so easy to see these pieces as more aggressively avant-garde, and use the notes to show the piano all four corners of the room at once, but Ammara’s elegance of touch means that even some of the more ‘difficult’ preludes take on an atmosphere and an often magical presence all of their own.The programme notes give each prelude a sentence or two of descriptive analysis, which helps untangle things much in the way of an annotative label underneath a painting in an art gallery – in other words, you can take them or leave them, but they will be of use to the uninitiated. One can go further, and plunder the analytical recipe books for additional comment, but for our purposes you need more to know if this is going to be your ‘thing’ or not. This is of course subjective, and I don’t want to ram music down your throat that you find you don’t like – even after a few hundred words of rhapsodic recommendation. At a basic level, all I can say is that if you do like the piano music of Messiaen, and also appreciate the fragrant complexities of Scriabin, the chromatic romanticism of Berg and on occasion the atonal rigours of Kreňek or the quirky imaginations of Ligeti or Janáček, then this will almost certainly appeal to your tastes.The Preludi run chronologically, so the more immediately dodecaphonic pieces open the programme. Even while the serial elements may at first create some resistance in the listener, the imposing drama of the first and the nocturnal atmosphere of the second soon convince that there is ‘something going on’, intriguing the ear and mind and drawing one in. Some pieces develop from a single line of widely spaced but clearly undulating notes, tracing patterns like a Paul Klee sketch. Some create static, dreamy worlds, and others could be ‘songs without words’ – imaginary letters, sung and recited to a long lost love. Scelsi was no isolated composer, and keen ears will spot the influences of Bartók and others. The second prelude of Serie II quotes Messiaen’s Quatuor pour le fin du temps, and shamelessly shows Scelsi proving to himself that he could create an individual piece in his great contemporary’s idiom. In some pieces the piano is effectively allowed to converse with itself – extremes of range and contrasting material pitting percussion against chattering chords above. Moods from extremes of melancholy, aggressive passion to even playfulness and jazzy abandon at times, they’re all here. The later Preludi gain and develop in terms of luminosity, meditative depth, Webernesque transparency and extremes of expression and content. Ligeti cited that he had been greatly influenced by Scelsi, and on hearing some of the Serie III and IV pieces one can easily hear why. In some of the pieces, the notes have all the significant weight and variety of scale and perspective of stones in a Japanese garden. In other of the later preludes we have to negotiate craggy and unwelcoming landscapes, but in no sense is the journey not worth the risk, and the rewards are always comparable with the efforts demanded.Apart from a recording of the 1936-40 Preludi by Donna Amato on the Stradivarius label (SVS33804), there seem to be no other recordings of any of these pieces currently available. With a superlative, demonstration standard piano recording and remarkably insightful performances, I can’t imagine this repertoire being bettered on disc any time soon, and only a further set of discoveries to extend this collection would seem to warrant a re-appraisal. The recording location is pleasantly resonant, and with plenty of extra acoustic information in SACD surround mode. As mentioned, the piano is captured in all its glory, with some stunning bass notes and that often elusive quality of simultaneous warmth and sparkle. The instrument must have been re-tuned a number of times during the sessions, with one or two numbers showing a few strings ‘on the turn’ as it where, but this is a minuscule and overly-picky comment. The technical demands of the music are often highly challenging, but Alessandra Ammara’s performances are never anything less than impressive, and often breathtaking. I for one am very glad to have been introduced to these fascinating pieces in such an empathetic and technically outstanding way.